Key lime pies are fantastic summertime desserts because they are always served cold, making the sweet-tart filling both delicious and refreshing. Most key lime pies, however, are baked and require that you turn your oven on to bake one. This Key Lime Pie Icebox Cake just might be a perfect summer dessert, capturing the creamy and tart flavor of a classic key lime pie in a frozen, no-bake form! The icebox cake is extremely easy to make. Like most icebox cake, it involves layering a creamy filling with pre-baked cookies, then allowing the layered dessert to set up in the freezer. This recipe uses graham crackers – which are a nod to the graham cracker crusts typically used with key lime pies – and a filling that combines sweetened condensed milk with lime juice. 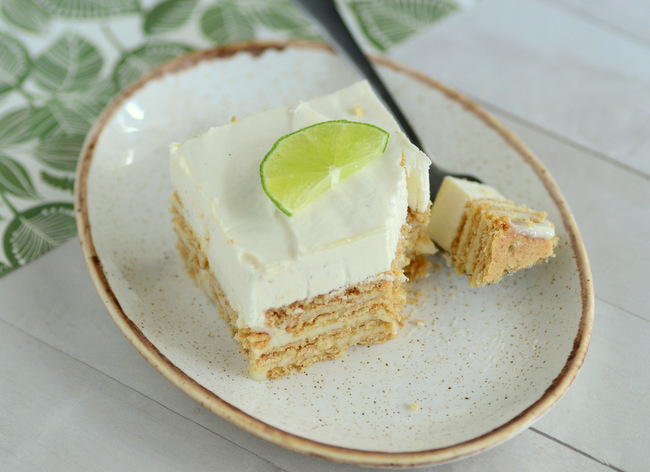 It is topped with a generous layer of whipped cream that is lightly sweetened with lime and vanilla, and provides a nice contrast to the slightly richer key lime layers below. Start by lining an 8-inch square baking pan with plastic wrap, then placing a single layer of graham crackers over the base of the pan. It is ok if there are small gaps between the crackers. Next, spoon some of the filling mixture on top of the crackers, ensuring that each has about the same amount on top. The layers are thin, but the filling has a lot of flavor. This layering process is repeated a few times before the final layer of graham crackers and whipped cream are added. As with all key lime desserts, this one will be especially good if you are using fresh key limes. Key limes are smaller than their regular cousins (persian limes, the variety usually seen in markets) and have a brighter acidity to them that really makes them pop in desserts, including key lime pie. 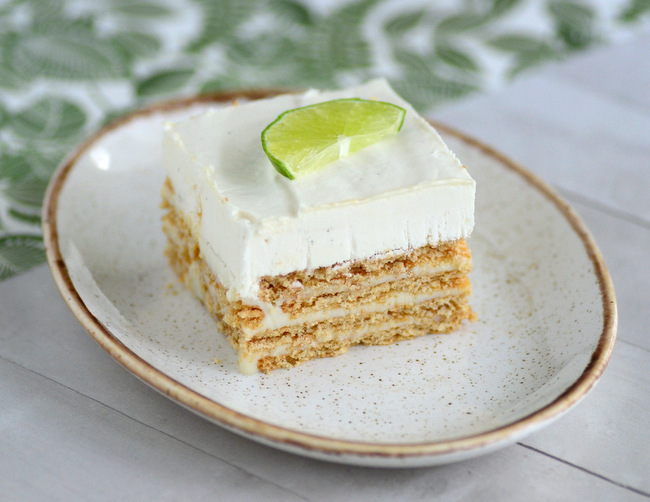 You can absolutely use regular limes if you don’t have access to key limes, however, and the icebox cake will still be wonderful. Regardless of which variety of limes you use, please use fresh juice for best results! The cake will take several hours to set up in the freezer and I generally recommend making it the night before (or at least 6 hours) before you intend to serve it. While it freezes, the layers meld together and the flavors really develop nicely. The cake will be easy to slice when it is frozen and can be served immediately, or allowed to come a bit closer to room temperature if you prefer the whipped cream topping to be a bit softer. In a large bowl, whisk together lime juice and sweetened condensed milk until well-combined. Set aside 1/4 cup of the mixture in a small bowl. Line an 8-inch square baking pan generously with plastic wrap. Place a single layer (4 sheets + 1 square) of graham crackers over the base of the baking pan. Spoon 1/3 of the remaining lime mixture over the graham crackers. Place a second layer of graham crackers on top of the lime filling, then top with another 1/3 of the lime mixture. Repeat the layering process one more time, then top the final layer of lime mixture with a last layer of graham crackers. In a medium bowl, whip heavy cream to soft peaks. Beat in vanilla extract and reserved 1/4 cup of lime mixture. Spread whipped cream evenly over the top of the cake. Freeze for at least 6 hours, or overnight, until firm. Serve cold. Previous PostPrevious Baking Bites for Bluprint: 6 Ways to Watermelon this Weekend! Nothing beats icebox cakes on summer days! It’s the perfect dessert when it’s so damn hot outside! This key lime pie icebox cake looks and sounds so delicious!